Click here to visit Denver B-cycle. Display Devices does development and manufacturing on an OEM basis for many companies and organizations. One of our areas of expertise is custom electronics including industrial automation and Ethernet control. B-cycle was created to answer the need for clean, convenient urban transportation. Based loosely on existing bicycle share programs, they set out to create a system that could operate world wide and address problems of security, safety, and logistics. B-cycle went to KIOSK Information System, industry leader in self-service kiosks, to produce the system for them. Display Devices has had a long relationship with KIOSK and when custom electronics is required KIOSK goes to Display Devices for development and production. 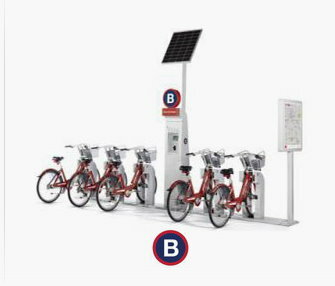 Each B-cycle kiosk has dozens of docks for bicycles and one central control system. Every bicycle has a hidden RFID tag which identifies the bike and each dock has local control board which reads that RFID tag. The local control board also has a second RFID reader which can scan a user membership card. If a user is a member, has a valid card, all he has to do is go directly to a dock with bike, scan his card and receive a bike. Behind the scenes the dock control board sends user ID to kiosk central controller via common dock bus, the central controller relays that information to large server via Internet (wired or wireless) and permission is sent back if user is valid and local control board releases bike. Information of what user has which bike and for how long is maintained in system. User does not have to return bike to same kiosk, but can return bike to different station across city. 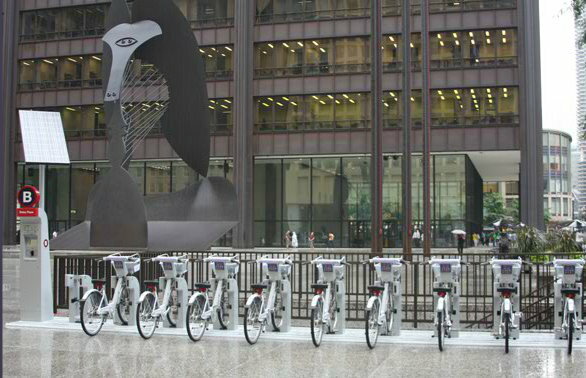 If user is not a member, user can still rent bike by using credit card at central controller. Because of our real time usage information B-cycle employees can move bikes from station to station to balance load if required. Any theft is detected as well, and valuable usage statistics is gathered also. The kiosks can operate totally off solar power and wireless connection to server enabling placing kiosk at any location. Display Devices was in the original development of system, creation of all custom electronics boards, and currently does production for the thousands of systems in current use. This is just one example of OEM electronics we produce. Please contact us with your requirements.